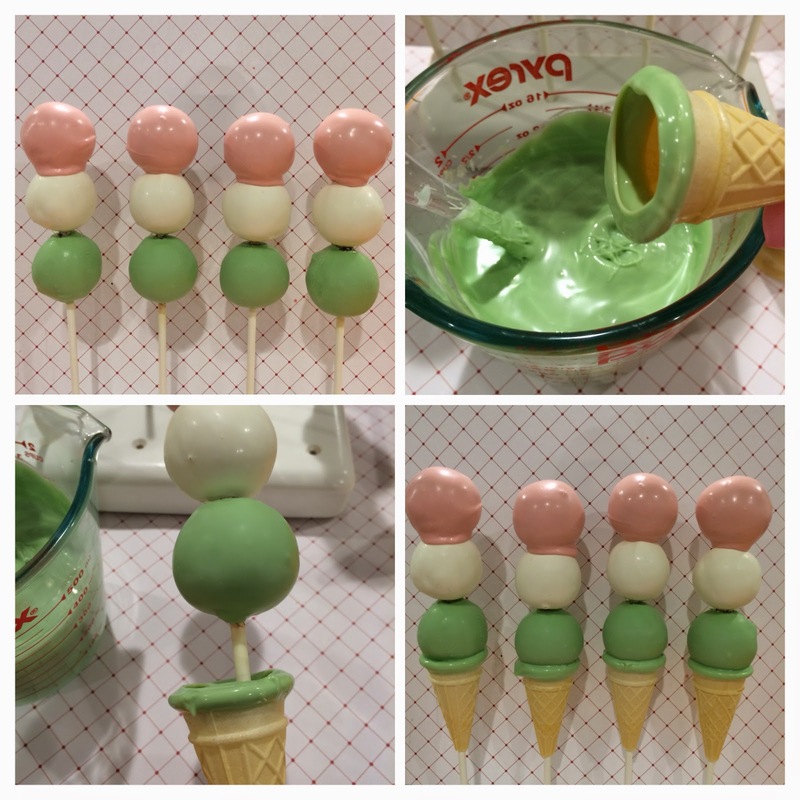 Your ice cream social isn’t complete without these Triple Scoop Ice Cream Cake Pops! These little cones won’t melt and they are perfect for party favors. I’d like to introduce you to my friend Rebecca. 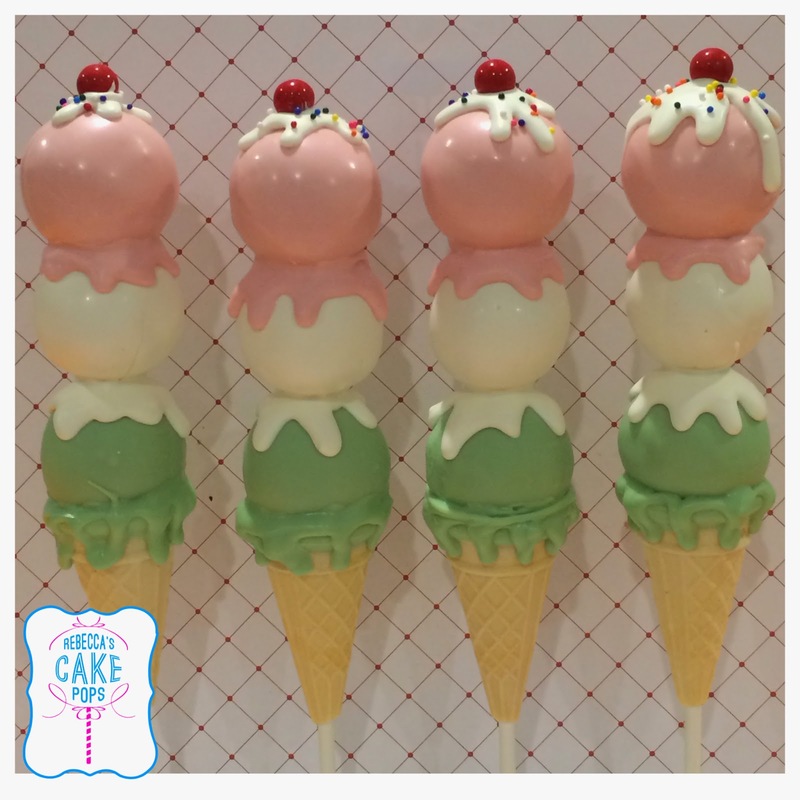 She makes some amazing cake pops and she was nice enough to make these wonderful Triple Scoop Ice Cream Cones for us! I know you’ll love them! Hello! 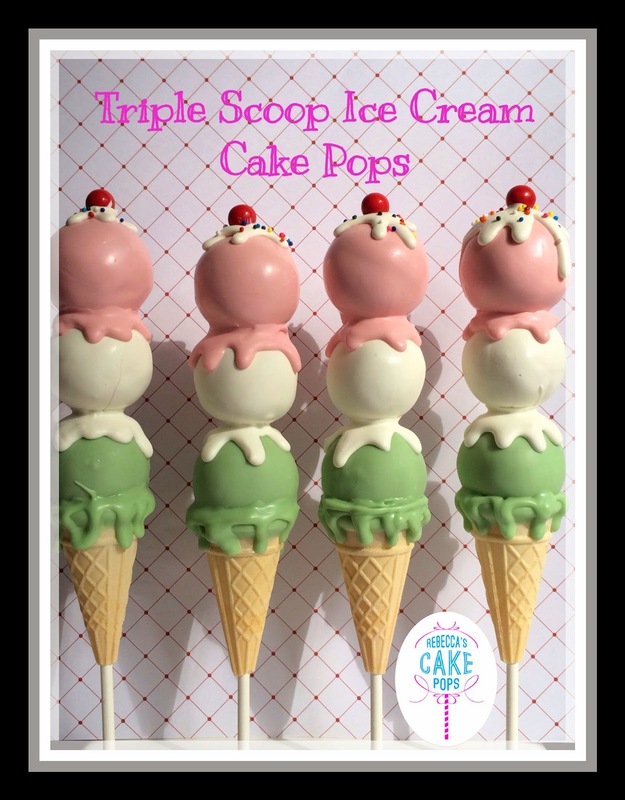 This is Rebecca from Rebecca’s cake pops and I’m going to show you how to create a Triple Scoop Ice cream cone. 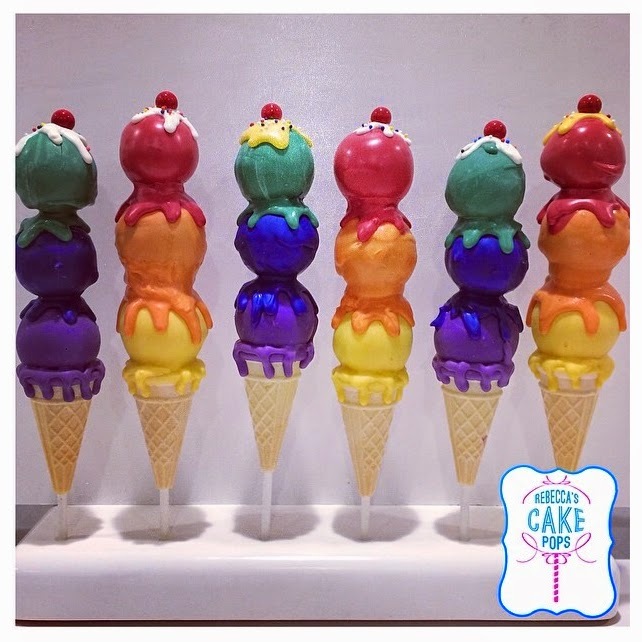 This idea came to me after numerous requests for the ice cream cone cake pop. If one scoop looked cute, maybe two scoops would look better. Then I thought…why not three? I must admit that I wasn’t sure if this idea would work, but I was very happy in the end. 1. 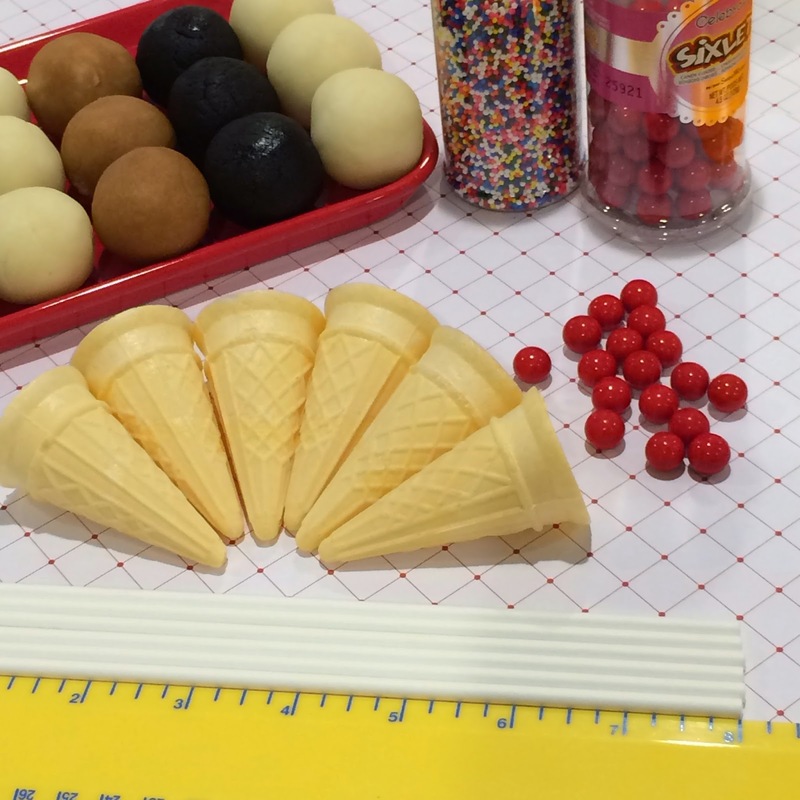 Cut the tips of the ice cream cones and practice inserting the sticks in them, making sure the holes are big enough. This will make it easier to attach the cone to the cake pop later. 2. Dip the tip of the stick in melted chocolate and insert it through the cake ball. Make sure the stick goes through the entire cake ball with a little bit of the tip sticking through. 3. Once inserted, dip the cake ball in the first chocolate color and tap off the excess. When the pop is dry, trim the chocolate off the tip of the stick, exposing the stick. 4. 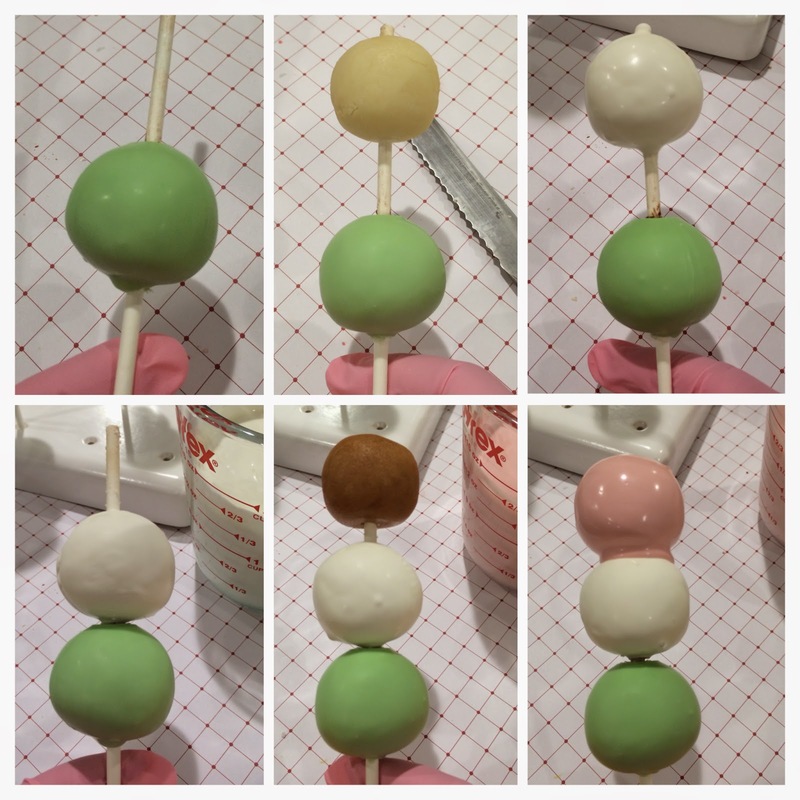 Carefully twist the cake ball down the stick and slowly push it halfway down the cake pop stick. 6. Insert the stick only halfway through the third cake ball. Dip it into the third chocolate color. Once you have tapped off the excess chocolate, slowly twist the two previous balls up the stick to meet the top ‘scoop.’ You do not need to wait for the top scoop to dry. 7. Dip the ridge of the ice cream cone in the color that coordinates with the bottom scoop. 8. Insert the cake pops into the cone, pushing it up to meet the cake balls. 9. Pipe melted chocolate onto the scoops to give it a dripping effect. Pipe a different color onto the top scoop. Add the red candy and non pareils while the chocolate is still wet. See, I knew you’d love it! If you love these cake pops, then please follow Rebecca on Facebook!